This week's TWD pick was chosen by Rachel of Sweet Tarte. This recipe was actually on my shortlist when it was my turn to pick back in June but I decided against it because I couldn't get fresh peaches. Unfortunately it is still winter here so no fresh peaches! This is essentially a sweet pastry base topped with custard, sliced peaches and a streusel topping. 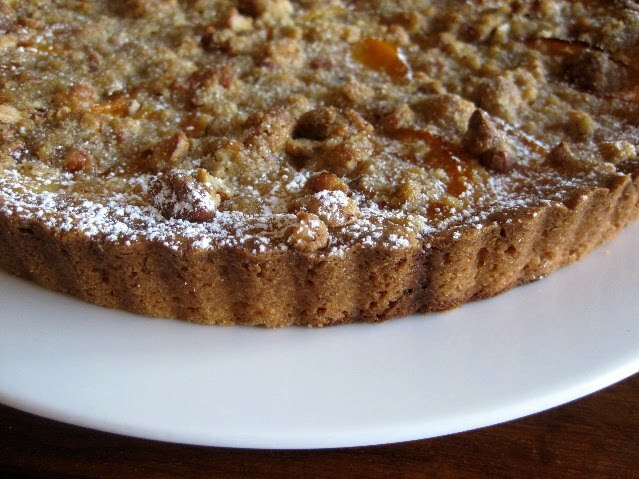 Just as the name says it is a 'Crunchy and Custardy Peach tart'! This was a breeze to make and as always I am grateful to have discovered Dorie's Sweet Tart Dough recipe. It has forever cured me of my aversion to making pastry. It was - nice. There was pastry, custard, peaches and streusel. All tasty. But there was definitely something missing and I think it was juicy, flavour packed fresh peaches. My canned peaches tasted quite peachy on their own but they were totally lost in this tart making the whole thing a little too sweet and a little bland. So disappointing! Thanks to Rachel for a great pick. Sorry I couldn't do justice to it! 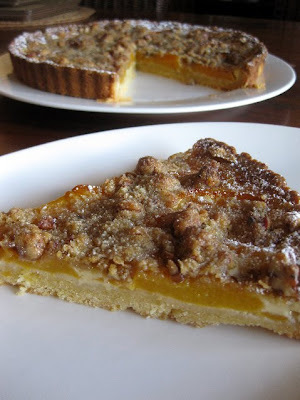 You will find the recipe on Sweet Tarte or check out what the other TWDers got up to here. Looks great! I loved this one. It certainly looks terrific. I have to take a look at some others. Mine did not brown very much although it was in, the right amount of time at the correct temp. It looks delicious! I also made a version with canned peaches and it still tasted pretty good. Your photos are gorgeous! Mine had fresh peaches but was still bland. It looks beautiful! I love how golden and crunchy your streusel looks! I totally agree with you about the sweet tart dough--it's a revalation! Sorry you couldn't get fresh peaches but thanks for baking with my anyways! Gorgeous! I didn't bake this week and seeing yours is making me wish I had! Oh no, fresh Peaches are hard to come by? I am sorry for the inconveniece BUT your tart looks delicious! Gorgeous strudel and all, YUM! I had to laugh when you said Yuck to the almond flavor. Cute =). this was good wasn't it. I used chopped pecans and liked it a lot better than walnuts. Looks like you got a good peachy layer too. What a lovely tart! I used pecans too -- great choice, don't you think? Ciao ! I love your tart and I'm sure it will be even better when you'll have real peaches !! I'm in love with Dorie's Sweet Tart Dough too! It is the best!